God’s Pocket is a strange conglomerate of ideas & people, ending in a chopped salad of good intentions that never quite comes together as a singular dish. First, if you recognize the name John Slattery, it’s for his acting not directing, as he has recently appeared in Spotlight and also many Avengers series films as Howard Stark. Oddly enough, his only previous directing experience is episodes of Mad Men, which you can definitely feel in the film. But this time his leading man isn’t Jon Hamm, it’s Philip Seymour Hoffman, in one of his very last leading roles, discounting The Hunger Games. Add in some organized crime, some dead bodies, some dark humor, & Christina Hendricks channeling Helen of Troy and you’ve got yourself a mess that only the most experienced or talented could rearrange into something compelling. Sadly, neither this story nor this review has a happy ending. It’s said that the simple working men of God’s Pocket, New York carry a certain dignity throughout there lives, marrying local girls, raising children who will never leave, harboring grudges that will last a lifetime, but always staying true to themselves, and always having the back of anyone who has lived in the ‘hood all their lives. So when Jeanie Scarpato’s son Leon dies in a work-related accident that seems a little suspicious, everyone has an opinion on what happened, as well as a nose in the affair, whether it was asked for or not. Micky Scarpato vows to dig into the death of his stepson, enlisting the help of his one & only friend, ‘Bird’ Capezio. But in a place where secrets never go undiscovered, it’s not about finding out who lied but rather making sense of the truth, a jumble of facts & feelings that won’t come clear to any poor sap living outside the Pocket. The best part of the film is the narration I tried to capture at the beginning of my summary, a fascinating & well-written take on the fate of those who make a neighborhood their entire world. The film then attempts to make that idea come to life, but never really succeeds, instead drawing out far too long a concept that is better summed up. 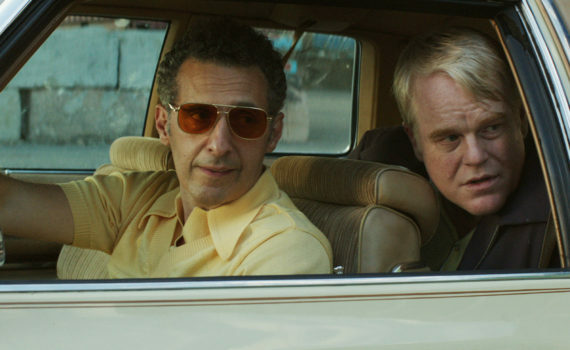 Maybe partly because of the Mad Men connection, but God’s Pocket feels like it could have made an excellent show, a weekly HBO series about the life of low level mobsters & all the crazy ‘hood rats that they call friends. Unfortunately, PSH is gone now, so that’s never going to happen. I would have loved more from him alongside John Torturro, who is too much of just a side character, the pair of them being able to take a mediocre plot and turn it into something great, I’m sure of it. As it was, the film has some great black humor, a cool cast of characters, but ends up a pilot for a TV show that never got off the ground instead of a solid, stand alone movie.